of his deceased grandson, Adam Wescott. On one of the busiest intersections in San Rafael, California resides the Retired Lawn. The retired lawn was created after the two previous attempts to establish a verdant natural lawn ended in failure due to poor drainage conditions. These failures sparked the imagination of the homeowner who then set about creating a low maintenance crushed rock surface. Once the area was laid out the effect was so stark that the owner Michael Duffy decided to purchase Snow White and the Seven Dwarfs he had seen at a local store and placed them on the new tableau. 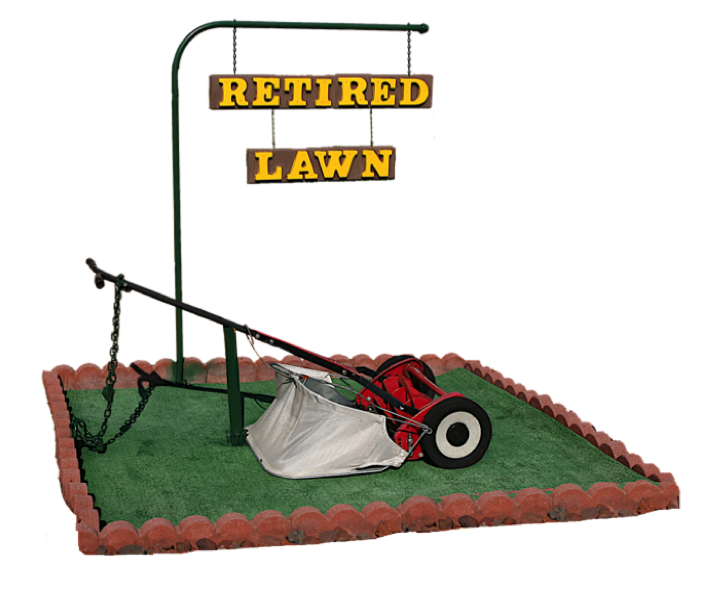 He then placed his old lawnmower on a large piece of astroturf and hung a Retired sign above it. Many passersby commented that it looked like a retired lawn so he then added “lawn” to complete the work. Over the past 33 years he has added more statuary and redesigned the backyard including a loving memorial to his 16 year old grandson who was tragically killed in an automobile accident. Retired Lawn is a unique and exciting vision seen and enjoyed by thousands of people everyday and a true testament to the creativity of its owner! Unfortunately Retired Lawn is no longer in existence since its creator passed away in November 2011.